Anderson Glover was diagnosed with congenital cataracts when he was 8 months old, but specialized treatment from UAB has provided new vision for a bright and happy child. 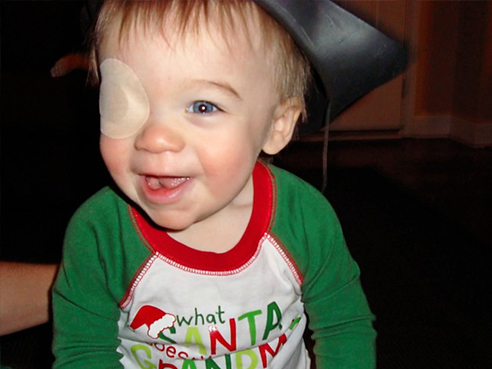 Anderson was diagnosed with congenital cataracts as an infant. Pediatricians told Melissa and Brandon Glover their son Anderson had developed congenital cataracts and there was not much they could do. Congenital cataracts, an opacification of the eye lens, are typically diagnosed at birth or infancy. As an embryo’s eye begins to form, a blood vessel develops that runs through the gel of the eye and functions much like an umbilical artery. The vessel inserts in the developing lens and surrounds it with nourishing blood vessels. This is similar to an umbilical cord; but instead, this cord nourishes the lens, says Martin S. Cogen, M.D., professor and division chief of pediatric ophthalmology and strabismus in the University of Alabama at Birmingham Department of Ophthalmology. Typically, after the lens is fully developed, this artery is not needed anymore, and disappears near the second trimester. Once in a while, this process goes awry and part of the artery does not disappear properly, leaving a defect in the lens. This defect progresses and eventually forms a cataract in the eye, continuing to cloud the lens until the child can no longer see. This is one of the more common forms and causes of congenital cataracts in children and exactly what happened to Anderson. After some research, the Glovers decided to travel from their home in Knoxville, Tenn., to see Cogen at Callahan Eye Hospital at UAB in 2011. During the visit, the Glovers decided to go ahead with cataract surgery using an artificial lens implant. Having to cover their child’s better-seeing eye for several hours a day, along with driving back to Birmingham to check on Anderson’s progress, was a lot to juggle for two working parents with small children. The experience was a challenge, but Cogen encouraged them that it would be worth the struggle. Cogen described the process as a marathon, not a sprint, informing the Glovers that, if they continued patching Anderson’s good eye, then he would have restored vision for the rest of his life. While at their last appointment during the 2016 Thanksgiving week, the Glovers learned that, for post-surgical unilateral congenital cataracts, vision is often 20/200. Then they learned that Anderson’s vision was 20/25. Needless to say, the family was thrilled. Anderson's vision after surgery is now 20/25.Properly patching a child’s eye is important because congenital cataracts can lead to amblyopia, which is decreased or loss of vision in one or both eyes because of abnormal visual input during the first few years of life. If caught too late, the chances of amblyopia are high because the brain has already had significant time to communicate with the good eye, neglecting the unhealthy eye. This makes amblyopia difficult to treat because, as long as the brain adapts for vision from one eye, a child will report no symptoms. By the time the child is old enough to realize that one eye is dominant, it often may be too late to reverse the condition. 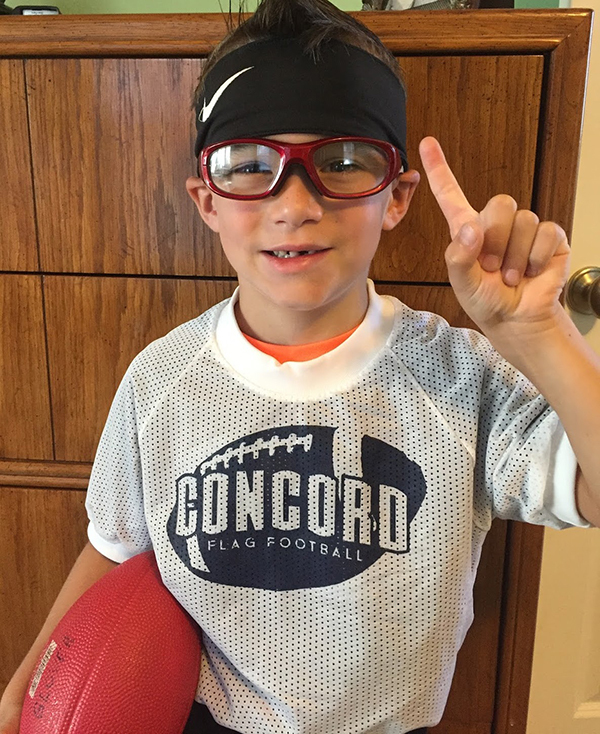 Anderson recently turned 7, and he loves science and football. Cogen has discouraged contact because of possible injury to the artificial lens implant, so Anderson has decided he is going to be a kicker. His dream is to be a marine biologist on the weekdays and a kicker on the weekends. Anderson is in the highest reading group for his school grade, and his family could not be more thankful. Melissa says all of these activities Anderson gets to participate in are miracles, because he was supposed to be blind in his left eye. The Glover family has learned a lot from this experience, but one of the most important lessons is the value of early vision screenings for children. “As parents, we do so many things to protect and nurture our children,” Melissa said. “We read to them and try to give them the right food with nutrients and vitamins.